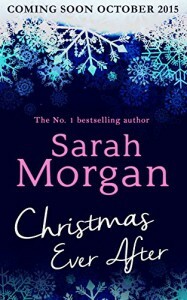 I discovered Sarah Morgan last year and since then I enjoyed her single titles series from HQN. Christmas Ever After is the last book in the Puffin Island series; this edition first released in UK and I was lucky enough that I could purchase it via Kobo, who provided this edition for international readers. I was especially excited reading this because of the animosity between Alec and Skylar in the previous two books. Different with the previous two books; Christmas Ever After didn't feature the Island in its entirety. In fact Alec and Skylar spent a lot of times in London as well as Alec's family house in Cotswolds. I found this quite refreshing actually - a change of pace and definitely a good set-up for Alec and Skylar to learn about each other without the interruption of their friends. The two characters were pretty interesting -- Alec came from a loving home, his parents were still strongly together, they were obviously close. But his marriage ended up in disaster, made him bitter and judgmental. He just couldn't trust women, especially those showing similar quality (or what Alec thought as same quality) as his ex-wife. While Skylar came from a family that was all business; definitely not the kind that show unabashed public display of affection. But Skylar was a romantic; she wanted love and all its glory and she believed in 'magic'. This contrast was interesting :). I found the part after Alec and Skylar returned to Puffin Island to be less appealing compared to their time in London and Cotswolds. Probably because the back and forth issue Alec and Skylar in defining their relationship, or Alex questioning Skylar's behavior (that he didn't thought of before), or Skylar saying sorry when she thought she stepped on Alec's toes were becoming repetitive. I mean, it was clear that Alec was not like Skylar's ex nor Skylar like Alec's ex -- and as a reader I got frustrated when both seemed to keep forgetting about it, then acted surprise afterwards. I also missed out the part of Skylar confronting her parents. After everything that she went through because of them, I wanted to see Skylar finally stood up for herself, and how their reaction was. I was robbed of that occasion sadly.